Create the light box by cutting small holes in a cardboard box and gently pushing the light through the hole. Place in the box in a comfortable spot and turn the lights on. Place the child under the lights so they can see the different colors. Note: Please provide appropriate supervision to the children in your care when completing all activities. You will need to decide what types of activities are safe for the children in your care. Appropriate and reasonable caution should be used when providing art and sensory experiences for children. **Always monitor children during the activity. Do not allow child to touch or play with the string of lights. 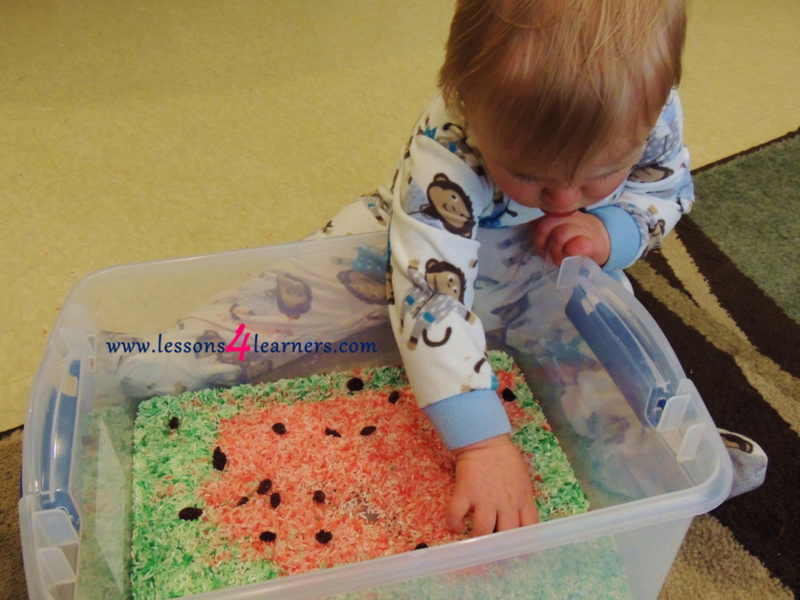 Observe and record the child’s reaction to the sensory bag. Did they seem interested in the snowflakes? How are their fine motor skills developing? Are they able to move the snowflakes around? Even before children can speak, they are developing an understanding of things in their environment by actively exploring them with all their senses. As they become more verbal, they are able to describe similarities and differences in what they see, hear, taste, touch, and smell. For example, each time a child explores sand, he is confirming his previous explorations and discoveries that sand is dry, gritty, and so forth, and he will eventually notice other materials that share those same characteristics. Children develop and strengthen new motor skills through shaping, molding, scooping, dumping and splashing — these actions all support the development of small and large muscles. For instance, holding a scoop to fill and dump sensory materials works many muscles used in other parts of the children’s day, as when they hold a cup or spoon at mealtimes.